It’s Wednesday and the folks at Eagle America have posted their latest “Deals of the Week”. You never know what you’ll find in the lineup but there’s a good chance there’s at least one or two items you can’t live without. Of course Eagle America has so much more than just what you’ll find on their “Deals of the Week” list. One such item are these fun and whimsical wooden bowl projects. 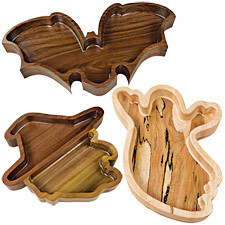 Just in time for Halloween, these three designs allow you to make unique and SCARY bowls and trays for all that candy and treats your kids shouldn’t be eating (for their own protection of course). According to the descriptions, these are quick and easy projects. Just the kind of thing you’re looking for on a fall weekend! In fact it’s so easy one of my co-hosts made one recently. Click on this link to his recent video of the experience The Wood Whisperer. « Roy Underhill, Fried Chicken & Sawstop?